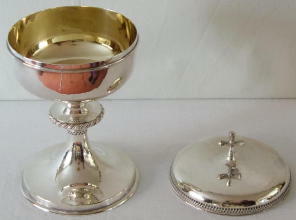 English solid sterling silver Ciborium, made in London, England, in 1957 by the Silversmiths Robert Edgar Stone. The Ciborium is completely solid silver. It bears the sterling silver hallmark and maker's mark. The Ciborium has a lightly hammer-beaten finish to the outside. The inside of the bowl and lid are gilded. The lid is surmounted with a decorative cross. The edge of the lid has decorative work all fine. The knop has decorative rope effect work round. Overall Height to top of cross 21.5cm. Diameter of base 12cm; diameter of top of bowl 11.5cm. Overall weight 578g. In excellent condition throughout. Please ask if you would like any further details or information about this Ciborium.